• Do NOT send your unit for service without obtaining a RMA (Return Merchandise Authorization). Audio Precision offers two levels of service (click table below) for its hardware products depending upon whether calibration is required. 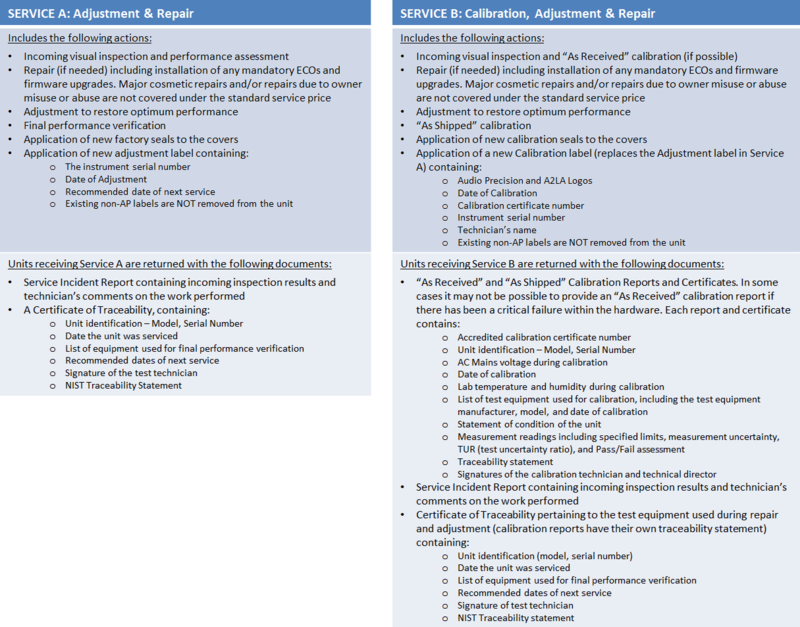 Service A does NOT include calibration, nor should it be used to assert or imply calibration status. Service B includes calibration. All calibrations performed at our USA factory are accredited to ISO/IEC-17025:2017 and ANSI-NCSL Z540-1-1994 by the American Association for Laboratory Accreditation (A2LA). Both Service A and Service B typically take two weeks from arrival of the instrument at the factory. Expedited service (1 week turnaround) is available for an additional charge. Audio Precision products that have been discontinued for a period of at least five years are placed in a product life-cycle category called “Conditional Support”. Conditional Support means that Audio Precision can no longer guarantee its ability to service or repair a product due to the unavailability of certain key components or assemblies, or depleted repair stock inventories. 1. The customer must first contact our service department for an initial consultation, then download and run an approved Self Test (called Performance Check for some instruments) that will assist us in evaluating the condition of the instrument. 2. If AP can determine the most probable failure(s) from the results of the Self Test (Performance Check) AND determine that all necessary repair parts or assemblies are still available, the customer will be instructed to fill out a Service Request form and send the product to AP’s US factory or to a specified service center. At that time, a non-refundable evaluation fee of $250 will be due, and AP will provide a non-binding estimate of total service charges. If AP cannot make a tentative diagnosis from the Self Test (Performance Check) results, or if it is totally non-functional, the unit can still be submitted for review subject to the non-refundable $250 evaluation fee. 3. Successfully repaired units will have the $250 evaluation fee credited toward the total service charges. These units will be returned according to the shipping instructions provided on the Service Request form. If AP discovers that a unit cannot be economically repaired, all service work will cease and the customer will be notified. All repairs performed on Conditional Support products will be on a “best-effort” basis subject to the availability of key parts and assemblies. In certain situations we may propose the use of refurbished assemblies from a previously salvaged unit. Please visit the Discontinued Models page to review the service status of all AP audio analyzers.